Damning footage shot at a pair of roadside zoos has blown the lid off an industry that profits by selling photographs of tourists with young tigers, usually at great expense to the animals' welfare. 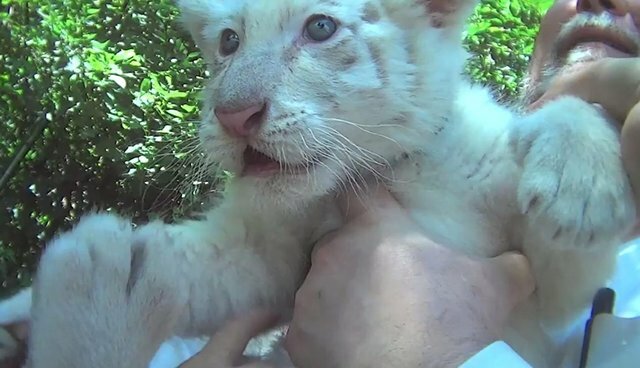 The footage shows animals separated from their mothers as young cubs, dragged on the ground, harshly handled and even hit by zookeepers at the Natural Bridge Zoo in Natural Bridge, Va., and the Tiger Safari in Tuttle, Okla. Things can go from horrific to hellish when the cubs are too old - and less willing - to take photos with tourists. According to the HSUS, most of the cubs are shipped to other roadside zoos, but there's also the possibility that they will be used for canned hunts or killed for their hides and parts. These tiger cubs aren't the only ones in unaccredited zoos in the U.S. The network of the U.S. tiger trade is large and unwieldy. Despite a 1975 ban on international tiger trade and a ban on interstate commerce under the Endangered Species Act, tigers make their way into homes and roadside zoos all over the country. Some states have regulations on owning big cats, but according to the U.S. Fish & Wildlife Service, there's no federal authority to regulate or monitor ownership of live tigers. Because of this, tigers like those in the footage above are left without an agency to ensure their livelihood. See this page to help stop the trade of tigers for roadside zoos.